If your heart starts to pound at the thought of a traffic jam or a cold caller interrupting the climax of your favourite TV show, you may need some help chilling out. Thankfully there are lots of gadgets to help, from smart lights to thinking putty, which could make you more relaxed than a yogi with a stress ball sitting cross legged in a zen garden. Here are some of our favourites. Fitness trackers aren’t just for marathon runners and gym bunnies. Fitbit’s Charge 2 and Blaze trackers offer guided breathing sessions simply called ‘Relax’ to calm the body and mind, making them handy for frazzled parents or harried office workers desperate to calm down. In relax mode, the devices monitor beat-to-beat changes in a wearer’s heart rate to determine their personalised breathing rate. Two-and five-minute sessions display real-time heart rate visualisations, animations and vibrational cues to help a user align each inhale and exhale with the guide and find moments of calm throughout their day. There are all the usual functions too, including a sleep tracker and ‘Smarttrack auto exercise function’ to recognise and log workouts, which can in themselves be a cathartic release from the stresses of everyday life. Your partner may give you a neck or back massage after an extraordinarily stressful day or on your birthday, but to soothe you on any other day, you can always count on a gadget. There’s a cushion with four heated balls inside that works in the same way as a shiatsu masseuse to relieve muscle tension. It’s powered by two strong motors which drive the four balls inside to be able to knead out knots and tense areas of the body. With a control to add heat to the balls too, it allows the recipient to use as much pressure and heat as they like, depending on the area they wish to de-tense, such as the neck, shoulders or lower back. 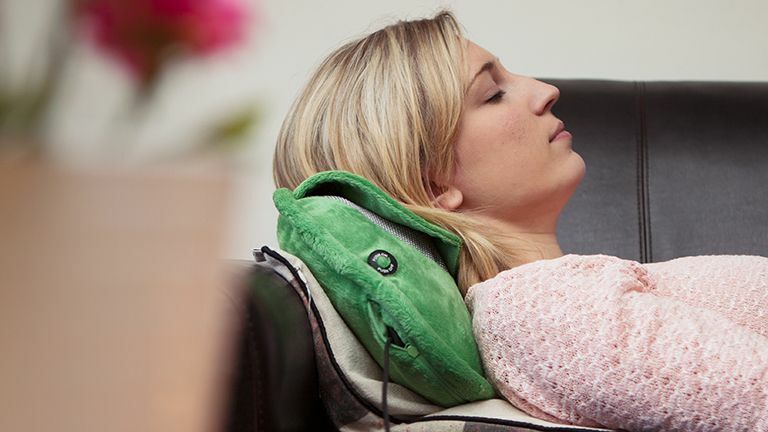 The cushion has a soft velour cover and comes in two colours – lime and pink - which may not be the most calming of hues, but the technology (and relatively small price tag) makes up for it. Yes, there are countless mindful apps out there to make you calmer and more appreciative of the world around you, but Aura is a favourite thanks to its bite-sized meditations. Every day users can take just three minutes out of their busy schedules to focus, with the help of a new, personalised mini meditation to do. The company behind the Android and iOS app promises users will never see the same meditation twice – something that’s otherwise bound to wind some people up - and there are new ones being created all the time. The app picks suitable meditations for users based on their age, self-declared stress levels and optimism but if that doesn’t appeal or stress levels are at an all-time high, there’s a ‘Mindful Breather’ feature to encourage users to synchronise their breath with an animated circle. The user interface is straightforward and uncluttered, which is calming in itself and there’s even a ‘gratitude diary’ to fill in, if that’s your kind of thing. Stress balls may be the cheapest ‘gadget’ designed to relieve stress, but they’re pretty old hat and not so effective. Instead, why not try some ‘thinking putty’, which you can knead mindlessly to relieve tension, or get creative with to take your mind off what’s bothering you. Crazy Aaron’s Thinking Putty is particularly innovative and available in many forms from ‘liquid glass’ to magnetic, which comes with a magnet, allowing a user to push, pull, twist, and bend the putty to their every will. There’s also ‘hypercolour’ putty that changes colour with the heat of a user’s hands – much like one of those 80s t-shirt that drew attention to sweat patches. The effect lets users create duo-toned sculptures and twists and the putty comes in a choice of four vivid colours. And for stressed-out tycoons and perhaps even Donald Trump, there’s special edition 24 karat putty containing one gram of real gold. The company says: ‘Real Gold Thinking Putty possesses a unique golden hue possible only from the rare precious metal in its purest form.’ It’s made to order, comes in a personalised tin and is crazily expensive at $250. Sometimes a brightly lit room is just what you don't want at the end of a stressful day when your head is pounding. But the Hive Active Light family lets tired users tone down their lighting without having to leave a soothing sofa, with the help of a smartphone, tablet or laptop and importantly, a Hive Hub, which can be used to control other devices too. The Active Lights come in three kinds: dimmable, cool to warm white and colour changing. They can be scheduled to turn on at certain times and intensities, using less energy than standard bulbs. The dimmable bulb is perfect for a relaxing or romantic evening, while the cool to warm light can change the mood of a room to make it seem warmer, more relaxing and cosy in the evening - the perfect way to get ready for sleep. Screaming and swearing can be cathartic, but so can singing at the top of your voice. Now there’s a tiny microphone that plugs into your phone that lets you belt out hits anytime, anywhere so the bathroom or car can be transformed into a karaoke booth. The Mini Karaoke Microphone measures less than 16cm tall and plugs into a smartphone. It comes with an additional jack so users can plug in their headphones and listen to music while they’re singing and works with most karaoke apps. It can also be used to make calls more fun and record memos, meaning fewer forgotten tasks and ingredients on a shopping list, for example, and therefore less stress. Oh, and it’s pretty good for impromptu parties to cut loose and let off some steam too. If missing pens or Windows meltdowns make you lose your cool at work, a massager for your office seat might help you hold off throwing your stapler in frustration. The ShiatsuMAX 2.0 Back and Shoulder Massager from HoMEDICS has 14 massage programs and fits onto most chairs, giving you the option to use it at work or home. There are two double massages nodes for ‘a deeper Shiatsu massage across the back and shoulders’, a rolling massage for a full back massage and heat option for muscle relief as well as an ‘invigorating vibration massage for upper legs or thighs’ – great for those who have overdone it in the gym. You’ve heard of fidget spinners – those little toys being banned from playgrounds that were originally intended to keep people calm instead of driving parents crazy. Well there’s another gadget in the fidget family. The Fidget Fingers Cube is a dinky device for that annoying person who has to keep their hands busy and could be great for obsessive nail-biters and the like. It’s designed to give stressed or bored people something to do with their hands and they can glide, roll, click, rub, spin and flip the different parts of the cube in any order to sooth away stresses (or stop doing something more destructive like mindless munching or picking at spots, for example). There’s a function on each face and it’s designed to fit in a pocket for relaxation on the go. If you'd prefer a spinner, take a look at our best fidget spinners page. This might sound like a sinister device from a sci-fi film, but the Alpha-Stim AID uses Cranial Electrotherapy Stimulation (CES) to keep you calm. This means a wave passes between two electrodes clipped onto the earlobes and sends a signal to the brain that reduces stress, anxiety and even depression, (apparently). The company behind the brain-bending innovation says the gadget safely modulates the brain’s electrochemical signals and doesn’t interfere with other treatments. ‘The results are proven and often immediate, with no lasting side-effects,’ it adds, and there’s a study underway to test its effects on people with anxiety disorders. A seriously calming device.